In addition to die-cutting and assembling shapes, petals, and leaves, we also specialize in fabric covered buttons, and creating and applying trimmings. Our embellishment trimming application to garments and accessories includes various styles and sizes of nailheads, pearls, grommets, rivets, and rhinestone embellishments. We offer hot-fixed jewels application as well. 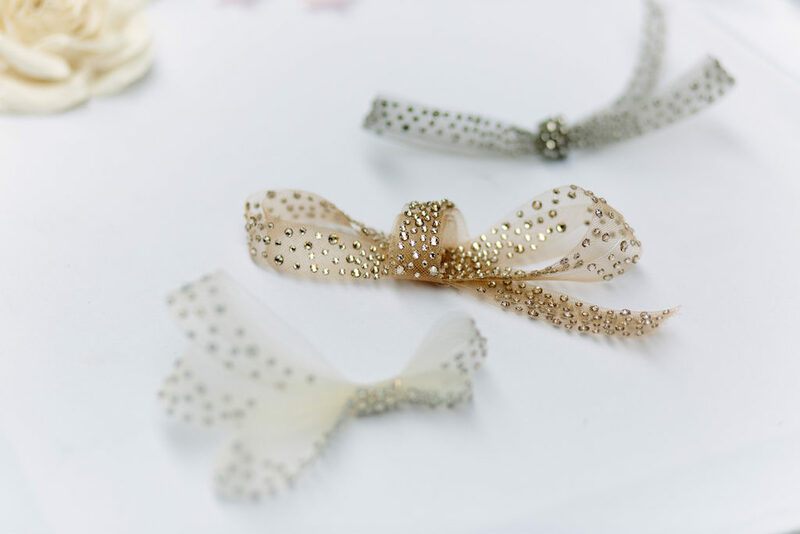 Some of our specialties include reproducing vintage trimmings that were originally made in the 1930s and 1940s, Swarovski crystal encrusting, and jewel embellishments. We are able to provide designer trimmings and also trim custom pieces, including for photoshoots or music videos. Through careful application and placement we can customize any garment with lettering or images. People who want to wear unique clothing, to be individually dressed, we can help create something special.